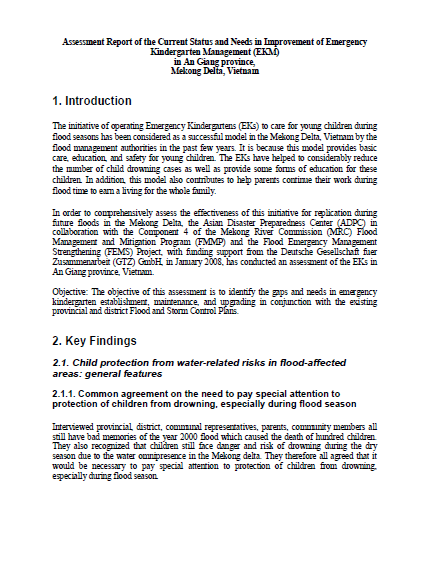 The initiative of operating Emergency Kindergartens (EKs) to care for young children during flood seasons has been considered as a successful model in the Mekong Delta, Vietnam by the flood management authorities in the past few years. It is because this model provides basic care, education, and safety for young children. The EKs have helped to considerably reduce the number of child drowning cases as well as provide some forms of education for these children. In addition, this model also contributes to help parents continue their work during flood time to earn a living for the whole family. provincial and district Flood and Storm Control Plans.